Spending too much time gawping at screens is making children more likely to be short-sighted, become overweight and get cancer, experts say. 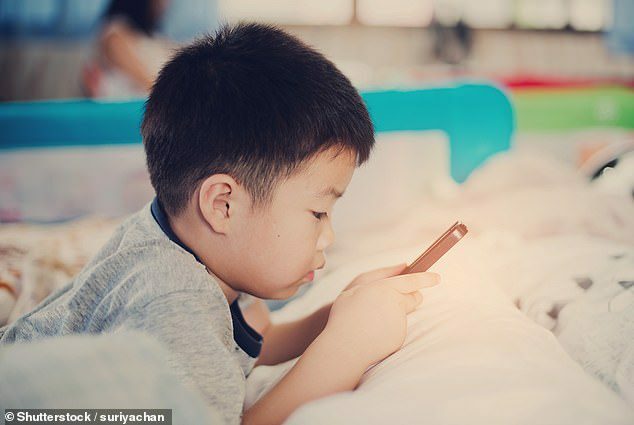 As well as increasing their risk of dying young, too much time on gadgets is damaging youngsters’ eyes – the number of short-sighted children has doubled in 50 years. It found increasing amounts of time spent on smartphones, tablets, and gaming is a big driver of children getting fatter – that and sugary drinks make up the top two. ‘The report highlights the importance of acting early to help prevent cancer,’ Sophia Lowes of Cancer Research UK told The Telegraph. The proportion of children worldwide with short-sightedness has more than doubled from 7.2 percent to 16.4 percent in the past 40 years. This effect has been dubbed ‘digital myopia’, and King’s College London researchers, in a separate study, found every hour a day spent on devices raised a child’s risk of sight damage by three percent. Eye expert Dr. Mohamed Dirani wrote in the British Journal of Opthalmology: ‘The age of smart device uptake is getting younger, with many two-year-olds spending up to two hours a day on devices.